Intoxicating night skies, a crackling fire and cozy tent space for two are just a few of the things you need for a romantic getaway with the one you love. Reserve your spot at one of these campgrounds—with lakeside cabins, storybook canoe rides and trailside waterfalls—where romance is easy to come by. 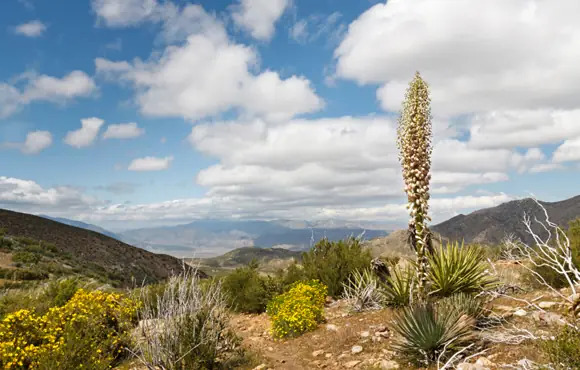 February is the start of wildflower season, so be sure to take a hike around the park. And, with little to no rain in the desert, you can keep your rain fly packed away and enjoy desert sunrises from the comfort of your own tent. Don't forget to look up while you relax around the campfire. The stargazing at this desert state park is considered some of the best in the world—and once the sun falls behind the mountains, you'll understand why. Expansive skies provide a glimpse into milky galaxies and make it easy to spot shooting stars. If you want to visit Virginia Beach, rest your head at First Landing State Park, just minutes from the hustle and bustle of the popular tourist attractions. Campsites tucked into small alcoves off the main campground road are ideal for a romantic evening at your campsite. With 19 miles of trails, you'll have plenty to do when you're not in town exploring. This campground, located between the Gulf of Mexico and Atlantic Ocean, is the epitome of tropical—relax at your campsite with swaying palm trees overhead and spend your evenings watching the sun set over the water. Get away from the campsite for an afternoon and head to the Conch Republic, an old Florida town with narrow streets and unique architecture, where you can wander around hand in hand. There are shuttles you can take to and from the campground. This semi-tropical barrier island provides 4 miles of white sandy beach and a maritime forest for you to explore. Spend a warm February day floating around the lagoon or head to the Marsh Boardwalk, where you can see a variety of wildlife. Want to try something new with your love? Go crabbing along the shoreline. At the end of the day, cozy up in a tent campsite or rent the one cabin they have in the park. Get lost in one of Georgia's seven natural wonders, Okefenokee Swamp, when you reserve a spot at this campground. As you paddle through the mysterious waters of the southern outdoors, you may see turtles, deer, herons and even alligators. Looming cypress trees on the shoreline make this storybook location a great spot for your romantic getaway. 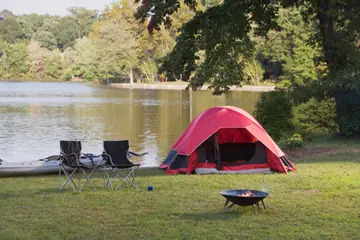 This year-round campground is the largest camping area in the Thousand Islands region, and is located in a secluded wilderness, accessible only by foot or boat. Recreation in the winter months includes ice fishing, cross-country skiing and snowshoeing. You may need to snowshoe or ski into the park if there's snow on the ground. Get cozy in this campground located at the base of the Cascade Mountains. Forested sites provide plenty of privacy for nights around the campfire, and the Trail of Ten Falls will keep you busy all day. The trail starts above a 100-foot waterfall, but that's just the beginning. As you hike, you'll catch glimpses of other waterfalls along the side of the trail. Silver Falls is the largest state park in Oregon, so if you don't want to hike, explore bike and equestrian trails. This small, 29-site campground is ideal for a romantic getaway. Trek 8 miles of trails where you'll see a variety of stately oaks and mysterious wetlands. Set up camp at site 12 for a lakeside spot, where you can watch the sun set over the water while you indulge in a fireside meal.